Heading into our 10th season, Home for the Holidays and Spring Fever are high-profile media events hosted by Lucid Communications. This year, we’re hosting our highly acclaimed Spring Fever preview in two markets again: Toronto (February 20 +21) at Erin Tracy Bridal and Fine Jewellery’s showroom in Toronto, and NYC (March 13+14) at AKA Smyth Tribeca. We have streamlined our client roster to create a cohesive story for our media guests looking for anything sustainable lifestyle related – from fashion to food, to beauty and health and home. We load in on day one into the venue, and carve out intimate vignettes for each brand to showcase their lines and products. We present on the second day on behalf of our clients, showcasing their products and pitch stories and features to our top-tier media guests, and then will host a Cinq à Sept at the end of the day for our blogger guests , health/beauty media and producers with onsite activations with select clients. One-on-one presentations allow each guest to view a selection of newsworthy high-end, lifestyle brands timed to coincide with their seasonal editorial schedules. 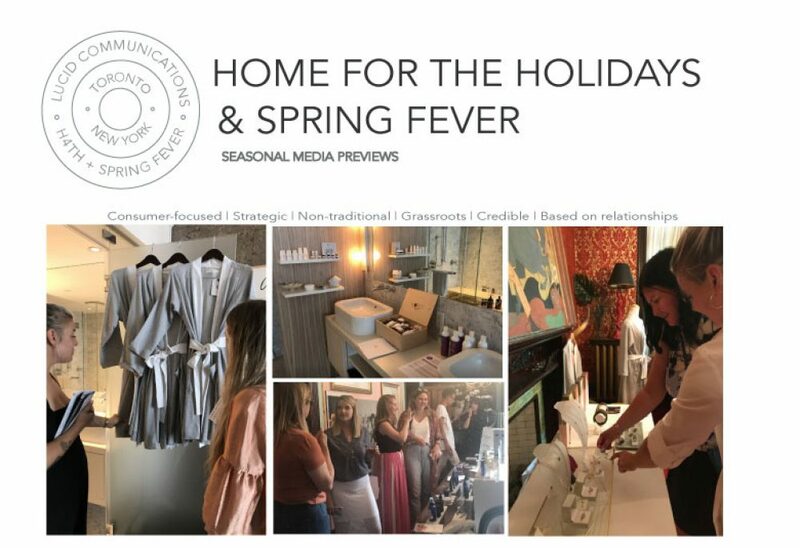 An original media list is developed each season to include editors, producers and influencers from the lifestyle, home, fashion, beauty, and health and wellness sectors. The experiential activation is designed to creatively tell each brand’s story, pitch product placement, generate product trial, offer story ideas and pitch spokesperson interviews on behalf of the participating brands. Below is a list of several media outlets that have attended these exclusive media presentations in the past. Following the presentations, each guest is provided a link to our secure microsite featuring supporting media materials and images. On-site photography at each event captures the activations as well and we will share on our social media channels as well. To ensure the participant’s seasonal stories remain top-of-mind, each journalist receives a bag of featured products to taste, try, photograph and report on for their upcoming gift guides, features and television shoots. Given the nature of long-lead appointments, media relations story pitching, placement and planning continues well after the last appointment to coordinate ongoing coverage with both attending and non-attending media. All coverage is tracked, and shared on social media to increase exposure. At the close of Day 1 appointments, Lucid Communications hosts a Cinq-à-Sept cocktail party for influencers, bloggers and beauty editors and producers. This event includes wine and food pairings, hair and make-up touch-ups, skin consultations, group walk-about presentations, and more. We are pleased to announce Lucid Communications will be returning to the U.S. to host a preview in New York City to maintain momentum with all American national major media outlets. This activation may also include opportunities for media desk side presentations for those editors we missed.